Bryan comes from an intensive research background in the Biomedical Sciences and specializes in Electron Microscopy, Immunology, Cardiovascular Biology and Molecular Biology. He is also responsible for teaching classes on scientific principles, language, reading, writing, ethics and presentation. He has over 7 years of experience in teaching at the undergraduate level and has spent over 6 years living in Japan. His scientific areas of interest include: cardiovascular necrosis, microfloral effect on immune competence and inflammation, and electron microscopy. 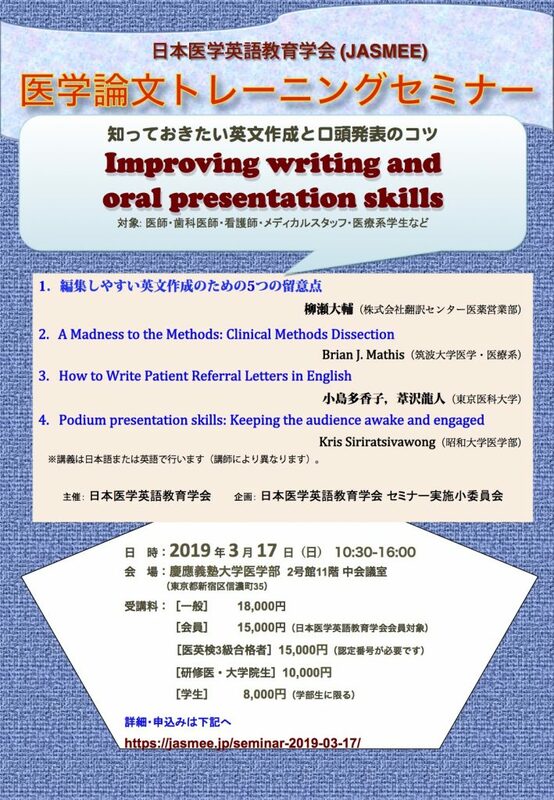 This presentation will look at how to organize and create a patient referral letter in English, by focusing on structure, content, common phrases and vocabulary, and by studying actual referral letters written by English-speaking doctors. Dr. Kris Siri is a United States board-certified Surgeon, who has been working in the Department of Medical Education at Showa University. He graduated from Yale University with a Bachelors of Science degree in Molecular Biophysics and Biochemistry, then attended medical school at the University of Pittsburgh. After residency training in General Surgery at the Naval Medical Center San Diego, he has served in various roles as clinician and educator, including instructor of the Advanced Trauma and Life Support course and the American College of Surgeons Accredited Education Institutes. He has been involved in the education of Japanese physicians and medical students since his time in the Navy, when he was the General Surgery department head and lead surgery educator for the Graduated Medical Education committee at U.S. Naval Hospital Yokosuka. In his spare time, he enjoys fitness and spending time with his daughter.